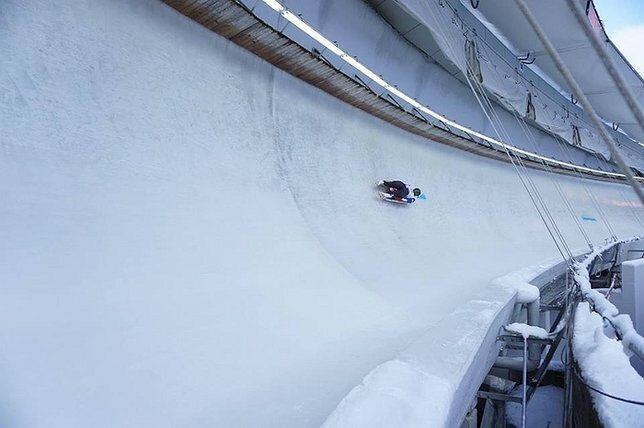 The World Cup luge season began in Austria this weekend. Photo by: USA Luge on Facebook. Igls, Austria - November 28, 2015 - USA Luge finished fifth, sixth, seventh and eighth in a pair of races on the first day of the World Cup season Saturday in Igls, Austria. Germany took women’s gold and silver with Dajana Eitberger and defending World Cup and World Champion Natalie Geisenberger, respectively, heading the field on the relatively short 1964 and 1976 Olympic track. American Summer Britcher, Friday’s Nations Cup gold medalist, led her team with a fifth place result, marking Britcher’s second best career finish. The Glen Rock, Pa., athlete came from seventh after one heat. In winning for the second time in her career and second in a row, Eitberger set a first run track record of 39.827 seconds. The 24 year old finished with a heat time of 39.968 for a combined 1 minute, 19.795 seconds. She also took gold in last winter’s season-ender in Sochi. Geisenberger, who has been nearly unbeatable since taking an Olympic bronze medal in Vancouver, rallied from fourth place in 1:20.009, with Canadian Alex Gough next in 1:20.017. Fourth place went to double Olympic medalist Tatjana Huefner, who has recovered from off-season Achilles surgery. The story was nearly identical for the German doubles later in the day, with Toni Eggert and Sascha Benecken grabbing victory ahead of Austrians Peter Penz and Georg Fischler, with Olympic and World Champions Tobias Wendl and Tobias Arlt in third place. It was the Igls hat-trick for Eggert and Benecken as they have won here three straight years. The USA’s Matt Mortensen and Jayson Terdiman, beginning their second season together, led three U.S. sleds by finishing eighth and may have been victimized by a late draw in slowing ice. “Jayson and I have been sliding pretty solid from start to finish here, even from Lake Placid on,” said Mortensen, a 2014 Olympian from Huntington Station, N.Y. “The training we had coming into this week was great because it allowed us some time to focus on our starts and get them to where they needed to be for this race. In addition to the ice conditions and the random draw, another issue is the length of the track, or lack thereof, on the course that lies on Patscherkofel Mountain. Mortensen and Terdiman stated that the first eight seconds can dictate the outcome. In addition, the unit tends to gain time as the run gets longer. However, there is no such luxury in Igls. The way Sweeney began her final heat in the women’s race, the Suffield, Conn. luger could have used a longer course to overcome an error that saw her hit the right wall at the start. The miscue ended any chance at her first career podium finish. Three time Olympian, Sochi bronze medalist and World Champion Erin Hamlin rocketed into second place after one run, with Sweeney .03 of a second behind her teammate in third place. Hamlin, of Remsen, N.Y. wound up seventh as snow fell in the second leg of the race. Raychel Germaine, of Roswell, Ga., made her World Cup debut in 21st place with a time of 1:21.058, highlighted by a 12th place second heat. The doubles winners posted 1:19.381 (39.689-39.692). Penz and Fischler set a start record in the first heat and had the silver medal time of 1:19.492. They were followed by Wendl and Arlt in 1:19.836. Mortensen and Terdiman’s eighth place clocking was 1:20.283. Jake Hyrns of Muskegon, Mich. and Anthony Espinoza of Park City, Utah, in their first World Cup race as a team, took 16th place in 1:20.710. Justin Krewson of Eastport, N.Y. and Andrew Sherk, of Fort Washington, Pa., also in their World Cup debut together, were 17th 1:20.794. It was just Krewson’s second World Cup start, while Sherk previously raced with Hyrns. Krewson and Sherk had the fifth best run of the final round. With the fastest individual heat times on the weekend determining the composition of the team, Krewson and Sherk will join Hamlin Sunday afternoon in the team relay. Race action in Igls resumes Sunday morning. Men’s singles action starts at 4:15 AM ET, followed by the team relay. Watch the action via the FIL’s live stream here. Subject: LongIsland.com - Your Name sent you Article details of "USA Luge Opens World Cup Season Placing 5-6-7-8 in 2 Events"